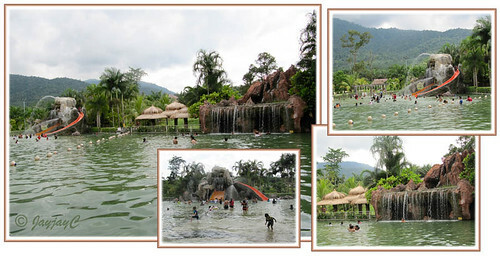 Malaysia’s largest and most well-maintained hot springs is Felda Residence Hot Springs in Sungkai, Perak. It’s better known by its previous name, Sungai Klah Hot Springs Park or Taman Rekreasi Air Panas Sungai Klah (TRAP) in the Malay language than its new commercial name. Here, you get to marvel at the wonders of nature that abounds and how it had been ingeniously engineered to offer a perfect getaway for a splashing, rejuvenating and exuberating experience for visitors. Covering an area of 15 acres, it is managed by Plantation Resorts Sdn Bhd (PRSB), a subsidiary of Felda Agricultural Services Sdn Bhd (FASSB) and is located at the foothills of the Titiwangsa Range, 200 ft above sea level, and wonderfully surrounded by hills and clear cold mountain streams and rivers amidst lush greenery, forests and the oil palm plantations. We were told that there are about 500 natural hot springs emerging from within the region! How awesome! Read further about hot spring at wikipedia encyclopedia where it’s stated that hot springs are produced by the emergence of geothermally-heated groundwater from the Earth’s crust. 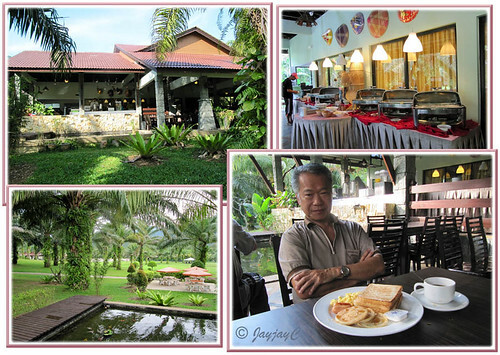 John and I had previously visited Sungai Klah Hot Springs Park as day trippers with friends but were drawn to return here recently for a short 3 days 2 nights vacation when we found out that it offers reasonably-priced accommodation too. Hot springs and pools, etc. 1. An Olympic-sized Hot Spring Pool that gets its heat sourced from underground. A favourite hot pool that is sufficiently warm for a dip or swim that is enjoyed by young and old alike, whether day-trippers or residents on vacation. 2. Mountain Springs Cold Pool – a super large-size knee-deep swimming pool that get its source of cool water from the mountain streams nearby. This is one heavily populated pool that is most popular, especially during the weekends, school holidays or public holidays. 3. A network of various-sized hot springs pools that were creatively designed. Water temperature ranging between 30 – 102 degree Celsius. Smaller pools below 35 degree C are suitable for soaking or submerging, while others for dipping your feet into. Some others with temperatures above 50 degree C are just too hot but all the same are presented to be marveled, such as the cascading hot springs and the like. There are ample signs to indicate the pools’ varying temperature and other significant notices. 4. 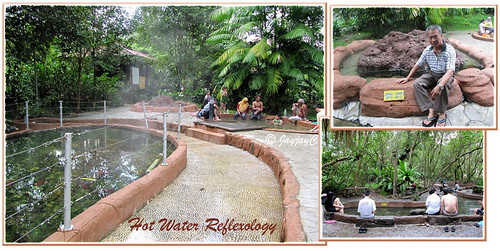 A 30 m water reflexology path – an area lined with small stones and covered with streaming hot water, just perfect to walk barefoot on and experience the gentle massage. Wonderful feeling! 5. 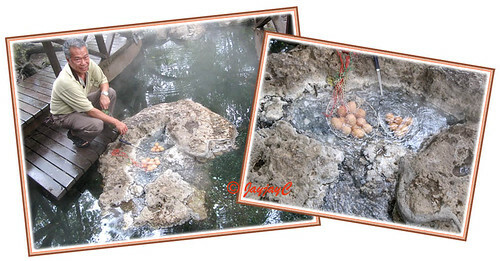 Egg boiling at a natural hot spring area, with water bubbling from underneath at a temperature up to 102 degree C is another very interesting and captivating activity. Baskets are provided for egg-boiling – you can bring your own eggs or purchase nearby. This is something fascinating that we wouldn’t want to miss for the world – it simply took 6-7 minutes for hard-boiled and 3 minutes for half-boiled. You can relish them straightaway! Close-by, there’s the hot spring pool area, with temperature between 40-45 degree C, great for dipping your feet for relaxation and have skin rejuvenated by the algae therein. 6. Board walk – the walk amidst the interesting fauna will lead you to the heat source of the natural hot springs with its water bubbling out from the small stream at a temperature between 60-102 degree C. At the platform that is built over the hot springs, you can experience the heat from the water below and observe the clouds of steam that arose with it. We were a little disappointed here as it wasn’t as remarkable as we’d envisaged. There were just small pockets of steam visibly seen that evening though we did have a sort of ‘sauna bath’ (sweated profusely) as a result. 7. Spa Village – this is where private jacuzzi or hot pools are designed for families or groups that want to enjoy in a private atmosphere. They’re available at reasonable prices, depending on the pool size. Water for the spa is pumped from a central hot springs pool with a temperature between 38-40 degree C. Traditional or ayurveda massages to relieve aches and stiffness are offered too. There’s much to enjoy and delight here! Truly scenic and spectacular! The management has taken pains to retain sections of its oil palm plantation to add much beauty, shade and interest to the region as a whole. Really beautiful! 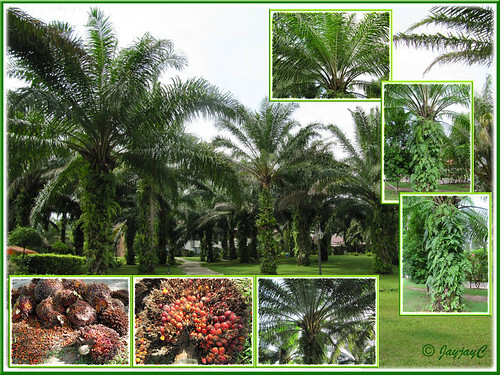 For us, town dwellers, it was a rare treat indeed to see such explicit beauty of the oil palm trees up-close! Great to be able to look up and see the fabulous spread of its fan-like fronds and the various kinds of ferns hugging the tree trunks. And an added bonus to see the trees being harvested of the ripened oil palm fruits during our stay there recently. The landscaping, flora and fauna are remarkable, to say the least. Everywhere and anywhere, you get to enjoy such amazing greenery and colours, giving much shade and coolness overall. Much of its surroundings that include huge rocks are left in its natural state. 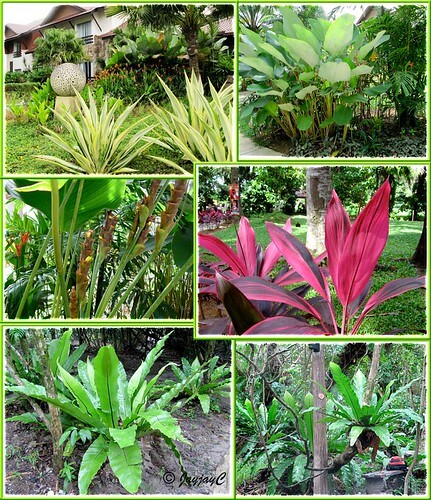 The beautiful gardens at the residence and park area are dotted with fabulous tropical plants and palms that are well-tended, some plants are even properly labeled and the whole complex almost immaculate! The staffs have done a great job in maintaining it, though it is an uphill task as there are still some litterbugs who refuse to be teachable! 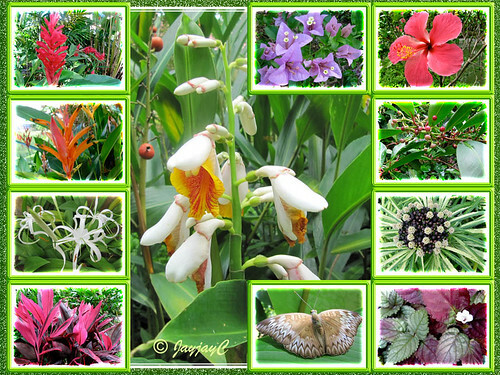 Do enjoy these photos that speak a thousand words of the beauty that abounds there. Birds, squirrels, butterflies and dragonflies were observed too, but sadly I’ve failed in getting their images to share here. To cater to the ever-growing crowd of visitors, ample parking bays are provided. Toilets and shower facilities are provided too. Other facilities include a large cafeteria that offers relatively cheap variety of food (such as fried noodles/rice and soups or western fast food) and drinks and houses a souvenir shop too. 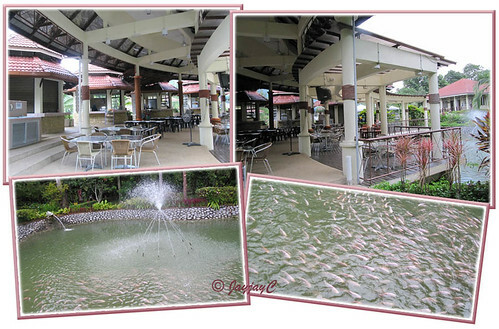 There’s a large fish pond facing it where you can feed the ‘talapia’ fishes therein…children would love this! There are some other stalls nearby, selling burgers and drinks too. Previously, food and drinks were not allowed inside the park, but this restriction has been probably lifted now. Close-by the cafeteria, a place of worship (‘surau’) for the Muslims is available. At the other end of the park, nearer to the residential hotel, there’s a coffee house that offers buffet breakfast, lunch and dinner or you can order ‘al carte’ only for lunch as informed. A little disappointing that at times, even an ala carte menu is not offered for lunch. It would have been better if ala carte menu is available for all meals so that visitors or residents have a choice when buffet-styled dishes are not suitable to their taste or health conditions. This was the only setback for us both. Accomodation in the form of villas or residential hotel rooms are available for reservation if you’d like to stay. Villas are for big families or large groups and include a private jacuzzi and kitchenette, while hotel rooms are suited for couples or a small family. Check at its website for accomodation and entrance ticket rates. My darling John and I thoroughly enjoyed our recent stay there during the last week of December. Hehe…just a short getaway to celebrate our 40th wedding anniversary. Truly a wonderful milestone for us both! Praise and thank the Lord! 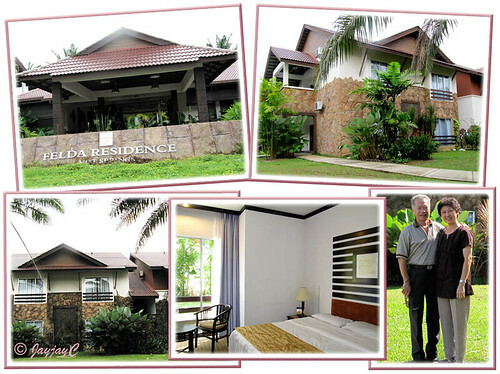 Felda Residence Hot Springs is located about 10 km from Sungkai town. It’s about 160 km (approximately 1.5-2 hrs drive) from Kuala Lumpur. Head for Sungkai toll exit 128 on the North-South Highway, turn left at the junction, then left again at 1 km away when you see the signage to Sungai Klah Hot Springs Park, and travel about another 8 km through the Sungai Klah Felda Village and oil palm plantations, before reaching the Park. Look out for the hot springs signage as you travel to guide you easily to your destination. Strongly recommended if you’ve not been there before. 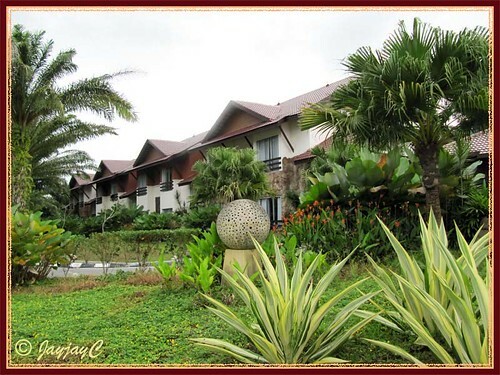 Sungai Klah Hot Springs Park Resort is quite a magical place really if you seek to enjoy the beauty of its flora and fauna and the amazing hot springs scattered about. Probably also, to just soak yourself in the hot and cold pools available, or simply to experience peace and tranquility in a natural environment, devoid of pollution and away from the bustling cities and towns. Wonderful place to unwind, enjoy and have fun! Great getaway for family outings! Beautiful photos, they attracted me to visit the place. It looks interesting~! Thanks, Kathryn! An interesting and remarkable place, indeed! Just stumbled here and wow! Just beautiful…….lovely indeed…..and I m not talking about the resort but of you both as a couple. 40yrs n still so loving….wow. congrats! Thanks, Razak! Happy to be able to introduce one of our country’s paradise to fellow Malaysians. Great to know that you and your spouse had a fantastic holiday with fond memories, yah! Sorry… i wanted to know per room how much per/night?included breakfast? hot spring ticket $$? Hi Vernice. Just follow the link to their website which is almost at the end of this article. I’ve just discovered that the related links were broken and have updated them. Aargh… quite bothersome as this company has been upgrading their site and changing the URLs a couple of times!! Hope this is final! What a detailed and interesting review from you. The pictures are simply amazing. I have planned with few friends to go to the hotspring next week and stumbled to your blog. I have shared this link with my friends as well. Wow, looks like a great place to go to relax and enjoy. Thanks. @ Sylvia – Thanks for your lovely compliment… it truly made our day. And we appreciate greatly you taking the trouble to share this link with your friends so that they too would be aware of this wonder happening in our blessed country. Hope you have a splashing and enjoyable time there next week! @ Cindy – It sure is a superb place. Do visit the hot springs if you can. Thank a lot for your sweet words, Azleen. Wish you all a superb holiday there. We’re also looking forward to spend 2 nights there with our sons and their family during the coming school holidays. Hope the place is maintained as beautiful and pristine as we last saw it almost 2 years ago. Hi Jacqueline , congrats to you and John on reaching a milestone in your marriage. My husband and I have a long way to go but hope we will be just as happy as you both are when we reach there! :) we will be going to sungkai this weekend with my in-laws on our annual family holiday. Personally I’m not really into hot springs so was wondering if the surroundings are conducive for a good run in the morning ? Thanks. we did our bookings throug groupons as it was fairly cheap and the place looked and sounded interesting. well, i have no regrets getting a 3 days and two nights stay. The rooms were very well maintained and clean. The hotsprings and the spring mountain pool was superb and relaxing, the staff was great besides the restaurant staff which was pretty unfriendly at times. anyhow, everything good view has it’s bad side as well which is definately the food…… food was extremely horrible and we have no option at all unless we drove out roughly 5km to get some mee rebus / satay or burger. I suggest you guys who might wanna go there get some maggie in the cup or so or you might just end up hungry the entire night as the restaurant’s last call is at 10.30pm daily. overall ratings 7 outta 10 but i would have rated it 10 outta 10 if the food was great………. @ Pauline : Thank you and may your marriage be as joyful, happy and peaceful from now onwards with God’s blessings. The Hot Springs Park is vast and will definitely suit your purpose. Wish you all a wonderful time there. @ Smuffz : Food was definitely a great disappointment for us too. I am writing because I need to compliment you for such well organised info & pictures in such orderly manner. I happened to be free and a friend asked me to help her organise a small church camp. I have checked few websites and blogs… but only manage to have a much clearer picture after reading yours. That helps a lot! Thankssss so much!! If I may ask for some suggestions.. for a 2D1N church camp of 20 pax, which consists of family with kids and may be 5 elderly.. would you have any suggestion for me in terms of itinerary? For example, would it be better to cover the hot spring early in the morning so that is not that hot? 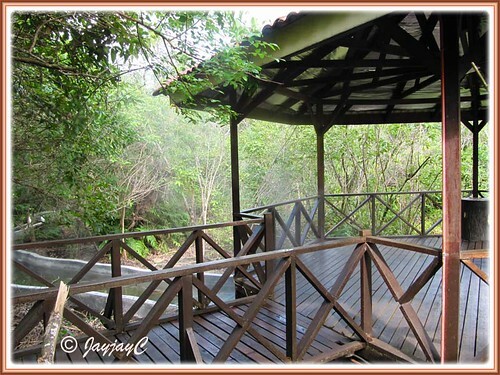 Was also thinking if we should go for jungle trekking (if there is any.. or just the broadwalk?).. if jungle trek, is the trail suitable for elderly? Thanks a million and God Bless!! You’re most welcome… it’s our pleasure really in sharing. Thank you so much for your sweet compliment. The Hot Springs Park is really vast, scenic and offers much in terms of enjoyment and wonder. So, it’s best to cover the place, including the board-walk, early in the cool morning with less people around and to avoid the huge crowd that will definitely converge later since it’s school holiday season. I’m not aware whether there’s jungle trekking available. You can phone FRHS for further info and make reservation via phone too as there’s limited quota for online booking. Apart from what I’ve shared in our article above, there’s one other nearby place that you may want to include in your itinerary, and that is, Sungkai Wildlife Conservation Centre. Hope all will turn out well for you and your group. Happy camping! Thanks for writing such a good review…i’ve been contemplating to go here since last year and noticed that groupon is having a sale on this again…after reading yr review i feel more comfortable to purchase the trip as it sounded so good… I’ll be travelling with a toddler n a 7-mo baby so cleanliness & comfort is most important in our hotel selection criteria..
And oh yess.. Happy anniversary for u & john….u guys looked awesome together!! Aww… Nany Rahman! Thanks a lot for your positive feedback and warm wishes – they’re very appreciated. I like how informative your blog is. May I ask a question? the water in the pool is pumped into the pool from the hot spring right? Thank you Geetha for your kind words. Regarding your question, I’m not sure whether the pool water is pumped from the hot springs available in that area.